You never know what you are going to miss until it ends. When I was a student, I thought of a college as about a nightmare: all these sleepless nights, tight deadlines and being on a short budget just drove me crazy. I felt so powerless that sometimes all the good stuff about student life seemed unreal. Now, I truly miss those times when my biggest problem was an unwritten essay or a tough professor. When I look back at my college life, I remember only crazy, weird but unbelievably happy situations. I am pretty sure that everyone has such great memories. The first thing that comes to mind is freedom. As a student you do not have a lot of obligations, you do not need to feed your family, parents help you with finances and you have an incredible amount of free time. And during college, that time was really free. You did not have to balance between your job, kids, and housework. When you felt fed up with all crap that was going around, you could just run away. Do not get me wrong, I am happy about my life but sometimes I miss the possibility to be an irresponsible, stupid kid. Gosh, I miss discounts so much. When you are on a tight budget, special offers are lifesavers. It is so sad that young people lose this privilege after graduation and have to pay a full price for a pair of jeans. One of the best things about college is the opportunity to see your friends every day. During college, your fellows are so involved in your life; they are always there for you. Unfortunately, after college this connection is lost. The older you get the more obligations you have and this gap between you and your college friends becomes only bigger. It is really hard to have exciting social life when you have a wife/husband and kids. Another thing that stands between you and college friends is distance. It is so easy to be close friends on campus. So if you are still a college student, have a remarkable social life. You are young only once. These are three things that I miss about college the most. I think I will always look back at that time with enormously big and happy smile. However, I do not believe that student years are the best. Yes, the real world is often so scary, but it is when the real life begins. And the best is yet to come. 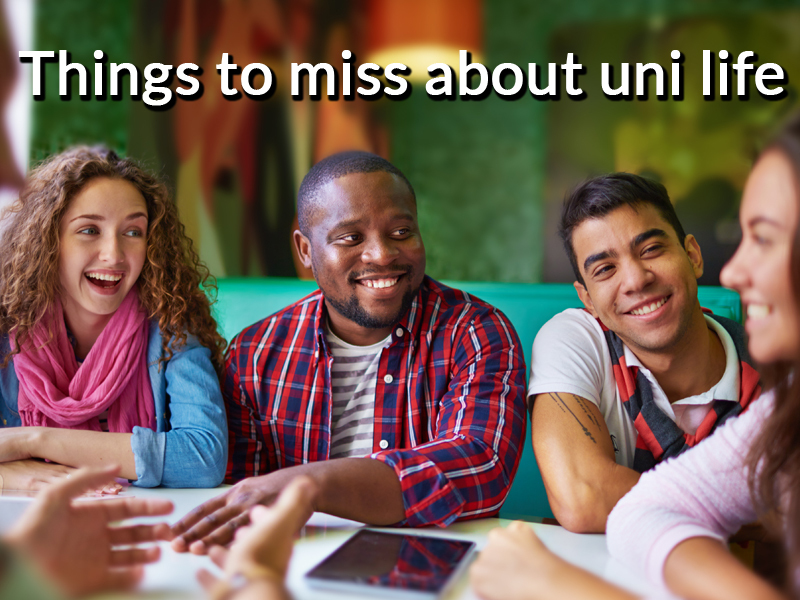 What do you miss about college life the most? Please share your thoughts in a comment section below.